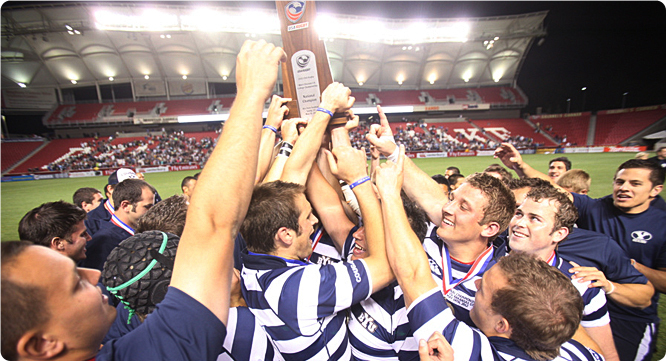 The BYU rugby team, with its 10 All-Americans, beat the Arkansas State Red Wolves to take home the 2012 National Championship and complete a perfect 17-0 season. Watch highlights from the match. For Monster Jam truck driver and BYU alumna Nicole Jardin Johnson, crushing Cadillacs is all in a day's work. Watch her catch monster air. See what student archaeologists dug up from the foundation of Provo's first tabernacle before the May groundbreaking of the Provo City Center Temple. Check out Hybrid Blue—the student-built hybrid race car that finished first in international competition and set a competition record. Find out which one. The Young Ambassadors just got back from performing and serving in Africa. Watch videos from their trip and download one of their original songs. What do the European Union's monetary woes mean for the United States? Hear EU advisor Antonio de Lecea explain. International studies expert Gerald Hyman says the United States is pushing its values on others. Hear how. Watch trade representatives from the Arab world speak on business opportunities in their countries. Vietnam's ambassador to the United States discusses the current state of relations between the two countries. Grad student Jacob Burdis created an app to help people understand Book of Mormon covenants. Watch him explain it. Find out why principals want to hire graduates of BYU's physical education teacher education (PETE) program. The McKay School's new student teaching option is an ocean away. Find out where—and why. The Internet is helping higher ed adapt to a changing world. Harvard professor Clayton Christensen explains how. Foul-mouthed characters in teen novels are rich, attractive, and popular, says a study by family life professor Sarah Coyne. This year's Karl G. Maeser Distinguished Faculty Lecturer, Rulon Pope, spoke on how food prices impact the poor. Opera You Can Laugh At? A comic opera billed with a Karate Kid–inspired poster? BYU's production of The Mikado is a must-see. English professor Lance Larsen was named the Utah state poet laureate. Read more in the Salt Lake Tribune. Dietetics professor Susan Fullmer was selected as president of the BYU Faculty Women's Association. Check out the thesis topics of 15 nursing students who presented their work at the annual Day of Celebration. Nursing professor Katreena Merrill has learned it's never too late to pursue your dreams. See how the Chemistry Department helped stats grad Cameron Willden land the job he's always wanted. These students got the experience every geologist dreams of—studying active volcanoes in Hawaii. Get ready for your close-up: three students are about to launch an app that remotely controls digital cameras. Mechanical engineering professor Steven Gorrell was named vice president–elect of a national aerospace association. BYU engineering students took first, second, and third place at a Utah bridge-building competition. Civil engineering professor Kyle Rollins won UDOT's Trailblazer Award for his research in load testing. Student Camille Borg donated more than 750 hours of pro bono work—and now the state bar is honoring her for it. Do international human rights transcend Constitutional values? Hear law professor David Kirkham's thoughts. Entrepreneurship is alive and well at BYU. See which ideas won big at this year's Business Plan Competition. What did you do when stumped by a tricky exam question? Check out these creative test responses from baffled students. A team of accounting students took home second place—and a $5,000 prize—at a national audit case competition. Dust off your calculator—here are four powerful math concepts that could change the way you do business. See how Rachel Buck can use what she learned at BYU to make the world better. Take a trip to the library's online collection of Yellowstone photos, books, and pamphlets. Grad student Shannon Zirbel's out-of-this-world research landed her a NASA fellowship. Budding young writers can sharpen their skills at BYU's new writing camps.